Tools at your fingertips… The Hoffman App! We’ve come up with the perfect solution to keep the Process with you by your side – the Hoffman App. Our App gives you the chance to stay connected to your Hoffman experience. You can work through the tools, express how you feel and receive ongoing Hoffman support and encouragement. Almost like having a Hoffman teacher in your pocket! It’s quite normal that when you leave the Process you are full of commitment to practice the tools on a daily basis. But as time goes on, we sometimes hear that people have forgotten how to use the tools, or ‘don’t have time’. We are now able to provide you with an App that gives you ‘Tools at your Fingertips’. Imagine being able to find out if there’s a Hoffman Graduate somewhere near you? Well now you can… As part of ongoing updates to the Hoffman App, we’ve introduced a new Hoffman Buddy geolocator facility. If you choose to make yourself ‘visable’ then you can see other Hoffman Graduates who might be standing right next to you. Try our Feeling Wheel: Type in how you’re feeling and spin the wheel and a top tool or suggestion will be given to you as if by magic. Imagine the chance to hold the yellow Wiffle bat in your hand again. 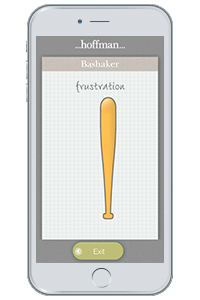 Well now you can with our Bashaker Tool! Grab your phone in two hands and spend some time focusing on and expressing energy associated with a negative pattern. Release the energy but don’t release the phone! The Hoffman Transference tool can guide you through the steps to acknowledging a transference and letting it go. The person you’re expressing a transference to doesn’t even need to know what you’re doing! Other Tools at your Fingertips include a place to write a daily Journal or add images to your Vision Board. The App gives you space to record share thoughts and inspirations with your friends or via social media. Available worldwide. Current languages are US, UK English, French, Brazilian Portuguese, Italian, Spanish, German, Argentinian Spanish… Spread the word! Don’t miss out! Download the Hoffman App today. We’d love to hear your feedback on the Hoffman App via our short (three minutes) survey, which you can find by clicking here. Thanks!